COOLER WEEK AHEAD: A cold front has made it's way through Middle Tennessee and it brought a little rain (just .03 in our rain gauge) and northerly to northwesterly winds along with cooler temperatures. While we'll see 68° for our projected high, tonight's lows are expected to be in the upper 30's. Unfortunately, we didn't get enough rain to wash away all of this pollen. The week ahead is expected to be dry once again (we've seen less than a 1/2" of rain during April) with a slight warming trend. Next chance for rain appears to be around Thursday. Typically, during April we see 4.60". ICELAND'S VOLCANO: Is it possible the volcanic eruption in Iceland could, eventually, affect weather right her in the Upper Cumberland? The answer is a complicated 'yes'. I wrote a short article on CookevilleTimes.com concerning this. 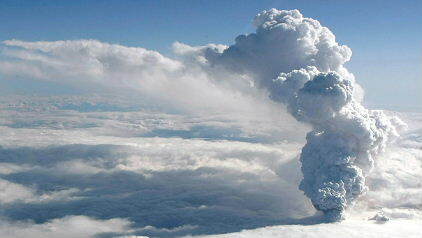 Volcanic eruptions have disrupted normal weather patterns in the past. Typically, a large volcanic eruption can spread enough ash over an area to cause a haze which can block the sun's rays causing a cooling effect. More to come on this interesting situation as the volcano continues to spew ash into the air.